On the cover: There is some debate as to whether bulbs should be included under the umbrella of succulents. The Journal aims to bring interesting plants to the attention of members so they may decide for themselves. 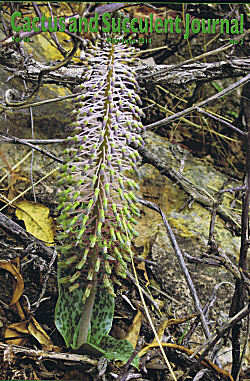 This impressive, foot-tall Ledebouria also shown in Fig. 11 on p. 95, has decidedly succulent leaves. It grows quite literally beneath Cyphostemma currorii in Namibia, where it was photographed and then turned into a herbarium specimen by Cody Howard, awaiting further work to determine its specific identity.